I’m not sure I know anyone who would pass up a bowl of homemade granola. If you do know someone who claims they aren’t a fan maybe you should make them some to let them in on the delicious secret. There about a million ways to make it but I prefer to stay on the simpler side with a basic formula that you can add or subtract to as your making it on a whim. 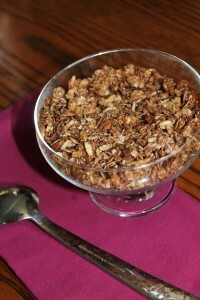 I’m sure you have tried many store bought varieties of granola like I have and they just cannot measure up. I have made this version of Sarah’s granola from my new roots for quite some time now and have just adapted along the way. I love her blog and the added nutrition explanations she gives with each recipe. If you have never had a chance to visit her blog I highly suggest taking a self guided tour. A simple and delicious granola recipe utilizing natural sweetener and coconut oil to deliver a wholesome treat! Measure out all the dry ingredients into a large bowl together. Mix together. Combine the agave, coconut oil and extract in a microwave safe bowl. Microwave for approximately 45 seconds and whisk to combine into a emulsified mixture. Pour the wet ingredients into the dry and combine until all the ingredients are coated. Spread in an even layer on a parchment lined baking sheet. Bake for 10 minutes and then take out the sheet to stir the mixture around to ensure even baking. Place in the oven for 10 more minutes, stir and then another 5 minutes to finish. Add the chia seeds and any dried fruit at this time. This recipe yields roughly 8 Cups and it works well for our household to divide into two containers and freeze one. Each portion lasts about a week with two of us eating it for breakfast or for a snack with yogurt throughout the week.